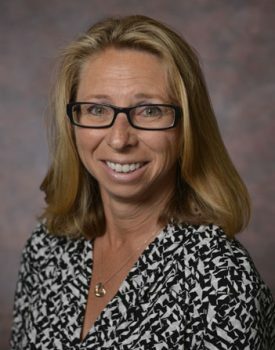 Share the post "Stacy Bonos Named 2016 Crop Science Society of America Fellow"
Stacy Bonos (GSNB’97), associate professor in the Department of Plant Biology, was elected a 2016 Crop Science Society of America (CSSA) Fellow, the highest recognition bestowed by the CSSA to its members based on their professional achievements and meritorious service. Bonos’ research is focused on developing improved, pest resistant and stress tolerant turfgrasses, which can be utilized for resource conservation and environmental enhancement anywhere cool-season turfgrasses are grown. Specifically, she is leading research projects on breeding for disease resistance and salt tolerance. Her work to develop modern strains of turfgrass that stand up to a variety of diseases and reduce the need for chemical applications has been well received by the turf industry. In addition, she is working to develop high yielding cultivars of switchgrass that can be utilized for biofuel production. These high biomass grasses are a potential renewable energy source that could help decrease reliance on fossil fuels and reduce the release of CO2 emissions into the atmosphere. Bonos has been previously recognized as the Young Crop Scientist of 2005 by the Crop Science Society of America. In 2009, Bonos was honored with the multi-state Plant Breeding Coordinating Committee inaugural Early Career Excellence in Plant Breeding Award and was named to its “40 under 40” list by Sports Illustrated Golf Magazine in 2010. She received her bachelor’s degree in Biology from Gettysburg College, and a master’s degree in Plant Science and Technology and a doctoral degree in Plant Biology and Pathology from Rutgers University.